Welcome to our website. We are a small scale producer of quality captive bred geckos from a variety of species. Our major focus is the common geckos of New Caledonia, but we are actively working with a number of other species. We strive to produce only the highest quality animals. Take a look around and contact us if you'd like. Lately we keep our Facebook page more up to date than our website, so make sure to check us out there as well. We hope you enjoy the site! Take care, and we'll see you around! 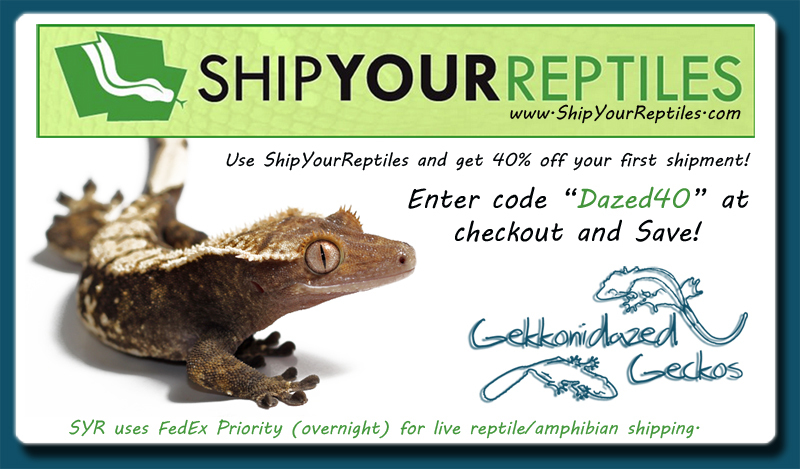 Proud shipper through Ship Your Reptiles! Click on the gecko to visit us on Facebook. All photos and content are the property of Kyle & Krystal Salzmann and Gekkonidazed Geckos. Please ask permission for usage.